Vishwakarma heritage Chalukya architecture and sculpture. The ancient name of Badami was – Badami. Vatapi was the Sanskrit name that the Chalukyas gave it, when they ruled over the area. Dr. Silakant Pathar, whose D. Litt thesis was ‘Badami- A cultural study,’ says the Chalukyas changed many Kannada names into Sanskrit. For example, Kisuvolal (red town) became Raktapura. Archaeologist Dr. A. Sundara, who surveyed 2,000 villages in Maharashtra and Karnataka, when he was with the Archeological Survey of India, has an interesting interpretation about how the association of the area with the asura Vatapi might have come about. The Puranic story says the wicked asura Vatapi was killed by sage Agastya. Aihole, near Badami, was a place where there was a merchant’s guild called ‘Ayyavole Ainuravaru.’ Sundara says an unscrupulous merchant might have lived in the area who might have been reformed by a wise man. Locals probably saw a symbolic parallel to the Agastya-Vatapi story, and thereby grew the legend that this was the area in which the Puranic incident took place, and that became Vatapi. Sundara even wrote a story for children based on this. randson was Pulakesin I, who built a fort in Vatapi. It is only in his time that the dynasty’s power really became significant. Pulakesin’s son Kirtivarman I fortified the city further and annexed areas in Maharashtra and Andhra. He died leaving behind his three sons – Pulakesin II, Vishnuvardhana and Buddhavarasa. However, since his sons were minors at the time of his death, Kirtivarman’s brother Mangalesa ruled as regent. In course of time, Mangalesa tried to establish his own line on the throne, but was killed by his nephew Pulakesin II, who reclaimed the throne, and ruled from 610 A.D to 642 A.D.In inscriptions, Mangalesa and Pulakesin II refer to themselves as Parama Bhagavatas, indicating they were Vaishnavites. The royal emblem was Varaha, further proof of their religious leanings. 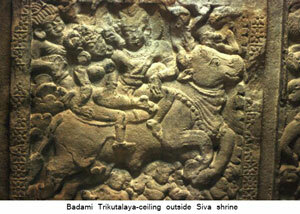 However, they endowed many Siva temples too. Mangalesa, for example, donated 10 villages to the Mahakuta Siva temple. Narasimha Varma Pallava (Maamalla) burnt Vatapi, the Chalukyan capital, and killed Pulakesin II. Those who are familiar with Kalki’s ‘Sivagamiyin Sabatham’ will be familiar with this historic event. Maamalla left behind an inscription in the Mallikarjuna temple in Vatapi. This inscription in their capital must have been a major humiliation for the Chalukyas. It was avenged, when Pulakesin’s great–great-grandson Vikramaditya II, who ruled from 734 A.D to 745 A.D., engraved an inscription at the Kailasanatha temple in Kanchi. Vikramaditya II married two sisters, each of whom built a Siva temple at Pattadakkal.I am curious about the Vatapi Ganapati, which is supposed to have been carried away by the Pallava general Paranjothi, after the sacking of Vatapi by Maamalla. “That is just a myth,” says Pathar. “There are no inscri ptions that talk of this. All the Ganeshas that are pointed out as Vatapi Ganesha in Chola territory are clearly of Chola origin.” In the Pattadakkal Chalukya temples, one will find both the Rekha Nagara and Dravida style. “In the rekha nagara, from a square garba griha rises a square superstructure (sikhara), curvi-lineal in profile. On the front side of the sikhara there is a replica of the main deity. In the Dravida style, one can see a garba griha, with a superstructure consisting of retreating storeys, with an octagonal, square or circular stupi,” explains Sundara. Inscriptions about the sculptors of the Chalukyan period abound. 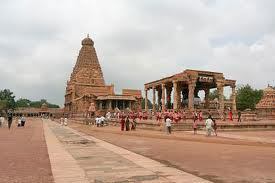 In Pattadakkal, there is an inscription about Sarvasiddhi Acharya, which says, “tenkane diseya” (southern direction). This led Henry Cousens to conclude that Sarvasiddhi Acharya must have come from Kanchi. But Pathar says there is another inscription, which, when read in conjunction with this inscription, clearly shows that Sarvasiddhi Acharya belonged to the Chalukyan region. This inscription refers to Sarvasiddhi Acharya’s student, Revadi Ovajja, who built the Papanatha temple in Pattadakkal. It uses the words ‘Tenkane Dise Madidor,’ meaning ‘the one who constructed the southern part of the temple.’ Likewise, the inscription about Sarvasiddhi Acharya must be taken to refer to his construction of the southern part of the Virupaksha temple. Interestingly the Virupaksha temple is in Dravida style, and the Papanatha temple is Rekha nagara, showing that Sarvasiddhi Acharya was the master of both the styles. He and Gunda Anivaritachari, who was also involved in the construction of the Virupaksha temple, were conferred the title ‘Perjarepu,’ which was a royal honour of the highest order. 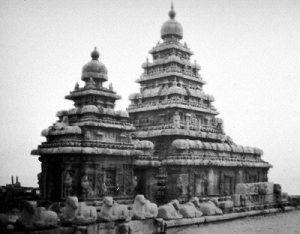 There were sculptors who came from Kanchi too, as for example a Pallava Achari, who is referred to in the Peddavaduguru inscription. picts the story of the monkey who paid with its life for its curiosity. The story goes that the monkey pulled out a wedge in a partially split log of wood, got entrapped between the two pieces and was squeezed to death. That Pulakesin I was a scholar can be inferred from the Nerur plates, which say that he mastered the Ramayana, Mahabharata and the Puranas. The tradition of scholarship seems to have extended to the women in the royal family too. Vijayamahadevi, the wife of Chandraditya, great grandson of Pulakesin I, was a poetess. She even ruled as a regent for some years. Clearly humility was not one of her qualities, for she says that she will bow only to Brahma and poets such as Valimiki and Vyasa. As for other poets, she will put her left foot on their heads! sanctorum are missing. The typical Chalukyan style sculpturing is seen on the lintel-Garuda holding snakes. This is a feature one notices in Chalukya temples, regardless of the deity in the garba griha. The inscription recording the construction of the temple can still be seen, though the temple wall has been whitewashed. 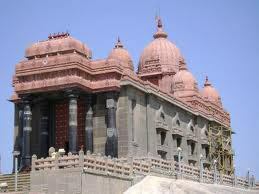 Why has the ASI not taken over this temple? Could it be for want of funds? The ASI’s maintenance of the Pattadakkal temples and Badami cave temples is excellent and one wishes it will also take charge of the Badami Trikutalaya. Be the first to comment on "சாளுக்கியர் கட்டிடக் கலை!"